7 + six = Required Please enter the correct value. In the early 20th century, Jacob Schiff of investment house Kuhn, Loeb & Co. in New York asked his London associate Sir Ernest Cassel how to ensure the Dominican Republic wouldn't renege on its debts. Cassel's response: "Your marines and ours." This conversation highlights the worrying relationship between U.S. bankers and international financiers with the U.S. government and military. It was one of many instances explored in author Ron Chernow's history of J.P. Morgan. And while these stories may seem like apocryphal retellings of darker episodes in U.S. financial history, one characterized by predatory trusts and robber barons, we haven't changed much since. The dollar is a weapon. One that is backed by U.S. military might. That has been shown to be the case throughout U.S. military history with Iraq, Iran, Russia, and any other number of U.S. adversaries that the U.S. Treasury seeks to cripple by shutting them out of international markets and financing. But the U.S.'s financial foes aren't taking it anymore. They want to bring an end to this financial weaponization of the dollar. You see, when the dollar reigns supreme, countries like China and Russia unwittingly find themselves paying for U.S. military expansion. 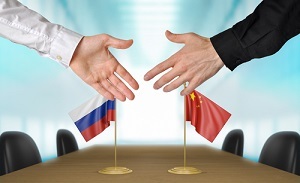 Russia and China receive payments for their goods in dollars when they export to the United States. They can either choose to let those foreign currency reserves sit at their account at the U.S. Federal Reserve, or they can buy U.S. Treasury bonds, which are denominated in U.S. dollars, and earn some interest. And with rates as low as they are, even those returns are becoming paltry. And what do these countries get for financing the U.S. deficits? Most currencies have higher rate of inflation than dollar, military might nothing to do with it – it's pure economics. No way to create replacement – the trust is a reason dollar is no.1 and if US will dump its debt and default, then some other currency will take over, despite military might. That is just the least of the US's worry. Much more potent is the AIIB, which China has founded last October with an initial $100 b and which is conceived as an alternative to the American controlled IMF. The bad news is, that some of the US's staunchest allies, including the UK and Australia and of course France Germany and Italy among others have flogged to it like starlings, to the cherry tree, much to the dismay of the US government. The only major allies of the US, which so far have not rushed to the AIIB are Canada, – the Harper government obviously intent to replace the UK as the new pet poodle -, South Korea, which needs US protection against its aggressive brothers up north and Japan, which has its own issues with China in the South China Sea. On a similar vein, Canada despite trying to become the new pet poodle has signed an agreement with China, which allows direct conversion between in their currencies without going through the USD. Heard the one about the ship and the rats? Pretty well written for a snowman. I do not know about the Chinese or Russians, but I would worry about getting paid off. The USA national debt is so huge that I will never be paid off. Can you blame them for protecting their national interests? The only reason, the creditor countries have still been buying up US debt certificates is because they are sitting on veritable mountains of them and stand to lose a bundle, when the USD drops in value. On the other hand, they cannot keep on supporting the Greenback, because that would just mean increasing a losing investment. Now the Chinese are building infrastructure all throughout Asia and Africa as a means to decrease their USD reserves. and create goodwill there, where the planet's economic future lies. Note that there are three east – west high speed rail lines planned between China and Europe, lining up the countries in between like pearls and opening them up for commerce. Besides that they are now constructing a pipeline through Myanmar to cut off the need to ship their oil supplies through the Straight of Malacca and arranged for the construction of an 'economic corridor' straight from the Arabian Sea through Pakistan to China. That would even eliminate the need for shipping some of their oil around the Indian peninsula to Myanmar. Can you see a pattern there? Can the US compete? – They would have to borrow the money for that from China.